During the winter of 1815, a revival on the Princeton college campus spilled over into the life of a young, intelligent female servant in the household of Ashbel Green, the college president. Betsey Stockton was baptized a year later. As her Christian faith matured, she longed to offer herself as a missionary. But what hope had she, an unmarried black woman, to reach such a goal? Betsey Stockton's mother had been a slave of Robert Stockton, one of Princeton's distinguished citizens. As a small child, Betsey was sent to the home of Robert Stockton's daughter, the wife of Ashbel Green. “By me and my wife,” he later wrote, “she was never intended to be held as a slave.” She was treated in their household kindly as a servant girl for whom they had a growing affection, included in family prayers, and “home-schooled” by Dr. Green. Shortly after Betsey's conversion, Charles Stewart, a Princeton seminary student and friend of the Green family, announced his plan to join a team of missionary pioneers to the Sandwich Islands (Hawaii). This lit a spark of hope in Betsey's mind. Could she not go with them? She had skills as a nurse and was trained by that time as a teacher. But American Protestants were not yet ready to send a single woman overseas without a protector. Dr. Green intervened with a strong letter of recommendation to the American Board of Commissioners for Foreign Missions, both for Charles Stewart and “for my Betty.” The ABCFM's solution was to commission Betsey as part of the Stewart family—“neither as an equal nor as a servant, but as a humble Christian friend.” With this ambiguous but trail-blazing appointment, Betsey Stockton became the first (documented) single woman missionary ever sent by a North American mission agency beyond the borders of the United States. During her two years in Hawaii, Betsey's most notable contribution was as a teacher. Other missionaries had already established the first schools on the islands, attended primarily by the upper classes. Betsey, the former slave, was the first to organize a school for the disadvantaged— particularly farmers' families. In 1825 Mrs. Stewart's failing health caused the Stewarts to return home, and Betsey went with them. But to the end of her life, this pioneer missionary woman retained an active interest in the welfare of all people, establishing schools for Native American and black children and serving as a Sabbath school teacher for 25 years, inspiring others to go into ministry at home and overseas. The father of the American foreign missionary movement never served as an overseas missionary. He was not a brilliant orator or scholar. Today, many people do not know his name. But in the first decade of the American missions movement, few people proved more important than Samuel J. Mills. Indeed, Mills was responsible for the event that birthed the enterprise. In 1806, Mills organized four fellow students at Williams College into a prayer group. One rainy day the group got caught in a rainstorm and took refuge under a haystack—and the American overseas missions movement was born. Mills's interest in missions started in childhood. His father was a Congregational minister; his mother, an admirer of John Eliot and David Brainerd, early American missionaries to the Native Americans. Samuel learned the importance of “disinterested benevolence”—doing good for others without caring about personal cost—from his father and heard stories about heroic evangelists from his mother. By the time he went to Williams College, Mills was eager to devote his life to God's service. Organizing proved to be one way for Mills to serve God and further the cause of overseas missions. After the haystack meeting, Mills created the Society of the Brethren, a group dedicated to promoting foreign evangelism. When Mills went to Andover Theological Seminary (where he befriended a recently-arrived Hawaiian man named Henry Obookiah) in 1810, he helped found the Society of Inquiry on the Subject of Missions. But Mills was not content organizing societies to promote missions. He wanted more decisive action. With three friends, he offered himself as a missionary to the Congregational General Association of Massachusetts. In response, the Association created the American Board of Commissioners for Foreign Missions, the most important missionary organization before the Civil War. When the first ABCFM missionaries sailed to India in 1812, Mills was not on the boat. The burgeoning movement needed his talents for promotion and organization in the U.S. As Mills advanced the cause, he became involved in other important reform movements. He helped found the American Bible Society. He went to the Mississippi Valley as a home missionary and worked among the destitute in New York City. He died in 1818 on a return voyage from Africa, where he had gone to purchase land for the American Colonization Society, a group working for the repatriation of freed slaves. He was 35. During his short life, Mills laid the groundwork for American foreign missions. He helped people who would become “heroes” of the movement—men like Adoniram Judson, a colleague at Andover—to go overseas. And he raised support for the enterprise—support that would enable missionary work to continue long after its founding father was gone. New movements need good recruiters. In the early years of American missions, enthusiastic supporters faced questions from churchgoers not yet converted the cause. Why try to save the “heathen”? Could they grasp the gospel? Would they care about the message? Was the enterprise worth the risk and the expense? Henry Obookiah silenced many doubters. A native Hawaiian who came to New England in 1809, Obookiah befriended missionary leaders such as Samuel J. 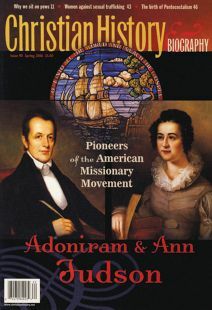 Mills and Adoniram Judson. He lived for a time with Yale president Timothy Dwight and with the family of Judson's future wife, Ann Hasseltine. After months of wrestling with his faith, he converted in 1812. He planned to go to Hawaii and work as a missionary under the auspices of the ABCFM. Obookiah's greatest impact on missions came after his death in February 1818 from typhus. Friends quickly published his story, The Memoir of Henry Obookiah. It was a bestseller and a boon to missions. The Memoir portrayed Obookiah as the intelligent man that he was. According to the book, he undermined the belief that heathen “are too ignorant to be taught.” The Memoir also described Obookiah's journey to faith. It reminded readers of his hopelessness without the gospel and his delight in his conversion. And it challenged readers to save the souls of those Hawaiians who still lived in darkness. In a few short years, Henry Obookiah had become a major presence in the young missionary movement. Mission supporters evoked his name in order to rally people to the cause. When the boat carrying Hiram Bingham and several other missionaries left New England in 1819 for Hawaii, they went, in no small part, because of Henry Obookiah. New mission fields in the 19th century proved as successful as Hawaii. Hiram Bingham was one of the reasons. When missionaries from the ABCFM landed in Honolulu in 1820, they found the islanders in tumultuous times. Foreign merchants and whalers had brought disease, alcohol, and a desire for cheap labor. Bingham's group of missionaries offered the Hawaiians something starkly different. They started schools, brought a respect for law, and propagated the gospel. By 1825, Bingham had converted influential tribal chiefs. Over the course of the next 15 years, over 18,000 Hawaiians became communicants in the church. Hiram Bingham was an enthusiastic missionary whose commitment to evangelism had begun early. While a student at Middlebury College, he attended prayer meetings for “the heathen.” After enrolling at Andover Theological Seminary, he announced his intention to become a missionary. Even his choice of a marriage partner demonstrated his missionary passion. When he graduated from Andover in 1819, he was engaged to a woman whose family did not approve of Bingham's intended vocation. He either needed a different job or a different wife. He found a different wife. At his ordination ceremony, Sybil Mosley, a young woman who wanted to be a missionary, asked Hiram for directions. He offered to drive her—and soon after to marry her. They had a wedding within the week. Hiram's enthusiasm and leadership earned him the loyalty of the Hawaiian chiefs and the respect of his fellow missionaries. He was a charismatic leader—self-confident, smart, and handsome. But he could also be difficult and inflexible. Some missionary colleagues thought him domineering. The ABCFM wondered if he interfered too often in Hawaiian politics—urging the king to pass “godly laws,” for example. The board argued that the missionary's focus should be on the salvation of souls and on issues that directly impacted faith. Bingham agreed, but he believed that politics did directly impact faith. Laws should reflect God's will. For good or ill, criticism did little to sway Hiram from his chosen path. Bingham was extremely productive during his time on the Sandwich Islands. He created a written system for the Hawaiian language and translated several books of the Bible. Since education was an important part of the mission, he wrote primers for children and catechisms for new believers. He and Sybil had several children—one of whom became a missionary in the Gilbert Islands. Deciding how to rear their children in a foreign setting was a continual concern for the Binghams. After almost 20 years in the mission field, the Binghams returned to New England in 1840 for what was supposed to be a sabbatical. But Sybil Bingham's health was poor, and the ABCFM had grown concerned about Hiram's tactics in the islands. The Binghams never went back. Even after Sybil's death in 1849, the board refused to reappoint Hiram. He remained in New England, where he pastored an African American church for a few years. Later in life, his friends helped support him financially. He died in 1869, shortly before he was to return to Hawaii for the 50th anniversary of the mission he had once led. The preaching of Christ crucified was to his mind a work of paramount importance to all others,“ J. H. Vinton wrote about evangelist Ko Tha Byu. ”He was not only not ashamed of the gospel of Christ, but he gloried in being its humble messenger to guilty men." Ko Tha Byu was an unlikely evangelist. He was born in Burma and was a member of the Karen tribe, a non-Buddhist ethnic group. At 15, he left home and became a criminal, committing about 30 murders before his conversion. In the late 1820s, he faced enslavement for his debts. A man of rage and violence, he was far from Vinton's description of a humble evangelist. Meeting Adoniram Judson changed Ko Tha Byu's life. A Burmese Christian had ransomed Ko Tha Byu from slavery but soon found his rage unmanageable. Judson accepted responsibility for him and began teaching his new charge. It was slow work. One missionary wrote that Ko Tha Byu's mind was “extremely dark.” Yet light broke in. Largely owing to Judson's witness, Ko Tha Byu converted and requested baptism. But Burmese Christians, aware of the new believer's past, questioned his transformation, and his baptism was delayed. The delay proved fruitful. In 1828, George and Sarah Boardman, Baptist missionaries working with the Karen people, invited Ko Tha Byu to join them. Boardman baptized his new colleague in the presence of three non-Christian Karens. The Karens asked Ko Tha Byu to accompany them to their village and preach. Ko Tha Byu accepted—and spent the rest of his life as an itinerant evangelist to his own people. Ko Tha Byu's ministry was a great success, partly because of the position of Karens within Burma. The Buddhist Burmese despised and marginalized non-Buddhists. Oppressed by their neighbors, the Karens were open to the gospel. Ko Tha Byu also proved to be an effective preacher. American missionaries noted that he was not well-educated and was not generally a quick learner—except when it came to Christian doctrine. The evangelist approached his faith with single-minded devotion and shared it with fervor. Poor health and Burmese persecution slowed Ko Tha Byu's ministry in the late 1830s. Rheumatism and failing eyesight made itinerating difficult. He settled with his wife and children in a small Karen village, where he continued preaching until his death in 1840. Karen Christianity continued to flourish after Ko Tha Byu's death. By 1856, the Karen church reported over 11,000 members. Today, about half of all Christians in Burma/Myanmar are Karens—a tribute to a most unlikely missionary. Sarah Johnson is a Ph.D. student in American religious history at Duke University. Eileen Moffett is a former missionary to Korea. Both near and far, the Judson legacy endures. What I learned from reading the letters of Ignatius of Antioch.